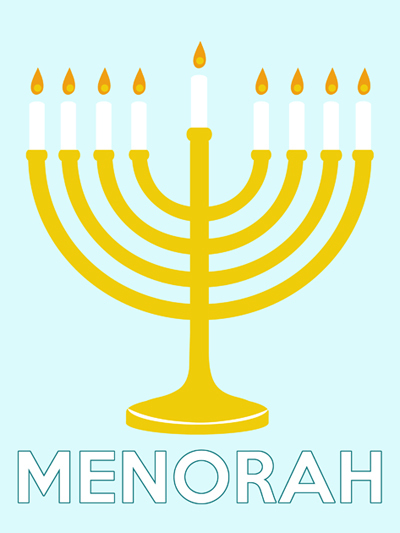 What You'll Need: scriptures, menorah poster, dreidel dice game, kwanzaa coloring page, markers for game such as beans, pennies or chocolate chips (15 for each player), coloring tools, tape or glue. Scripture: “We claim the privilege of worshiping Almighty God according to the dictates of our own conscience, and allow all men the same privilege, let them worship how, where, or what they may” (Articles of Faith 1:11). People all over the world worship God, Jesus Christ or other religious figures differently than we do. The Prophets tell us that people of other faiths do much good and help make the world a better place. We should respect them and work with them to do good. Around Christmastime we always think about our Christmas traditions. We celebrate the birth of Jesus Christ like other believers in Christ all over the world. In our schools, friendships with others, and through media we may see people of other faiths or cultures celebrating their Holidays. 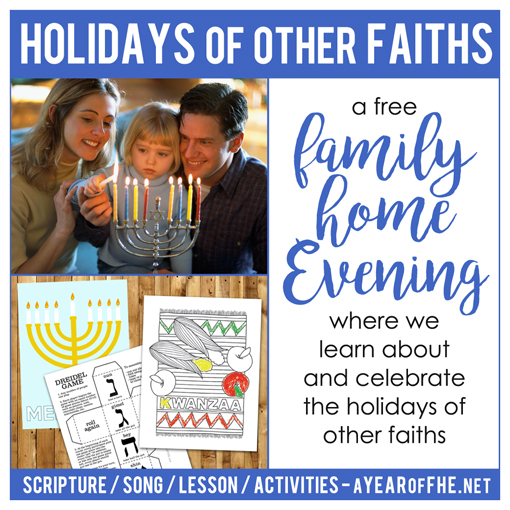 You can respect others’ holidays by learning about when and why those days are celebrated. Today we are going to talk about holidays other people celebrate during December. Yes! We celebrate Christmas, but so do people of many other faiths. People who celebrate Christmas as the birth of Jesus Christ are called Christians, but Christians can be from different churches. We are Christians because we believe in Jesus Christ, but we are also members of the Church of Jesus Christ of Latter-day Saints. Other Christian faiths are Baptists, Catholics, Lutherans and many others. Members of the Catholic church often attend Midnight Mass on Christmas Eve. The Midnight mass is a ceremony that celebrates the birth of Jesus Christ. Kids are usually excited about attending this because most of the Churches have beautiful Nativity Scenes and an array of Christmas lights. Some Churches even have a fireworks display after the mass as a sign of celebration. Millions of people around the world with no religion also celebrate Christmas and Christmas Eve as a time to treat others kindly, give gifts and celebrate family. Because Jewish people do not believe in Jesus Christ they do not celebrate his birth at Christmas. But in December they celebrate Hanukkah. Many years ago there was a war in Jerusalem and the Jewish people's Temple was taken over by others. They were very sad about it and fought in the war to get their Temple back and won. Once they had the Temple Mount in Jerusalem back, the Temple had to be rededicated (or made special again after being used by other people). The Temple was supposed to have a candle which always burned, but the candle had been blown out. They were sad to see they only had enough consecrated oil to burn for one day, but the oil miraculously lasted for eight days until new oil arrived to fuel the flame. There are special prayers and songs for Hanukkah. Part of Jewish Hannukah celebrations are also special food and games. 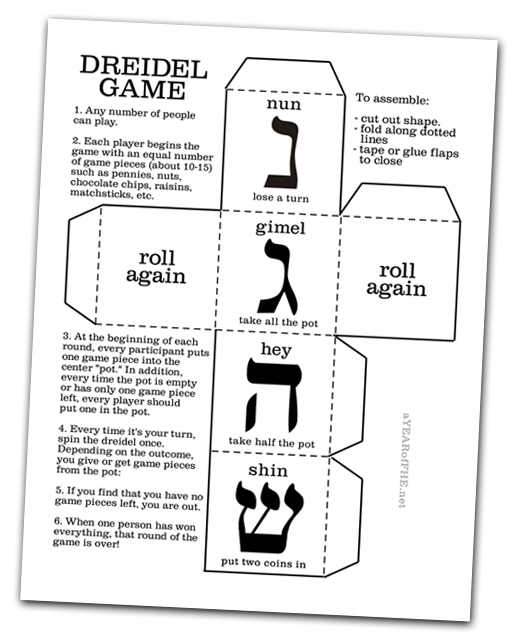 Jewish children play with a toy called a dreidel which is a spinning toy with four Hebrew letters, one on each side. The letters - shin, hey, gimel and nun - are the first four letters of the Hebrew words "A Great Miracle Happened Here." You get points depending on which letter it lands on. Jewish families eat foods that are fried in oil at Hanukkah, since oil is such an important part of the holiday's history. In most families, this means potato latkes which are crispy potato pancakes and other fried foods. Jewish children receive presents on each of the eight days of Hannukah. 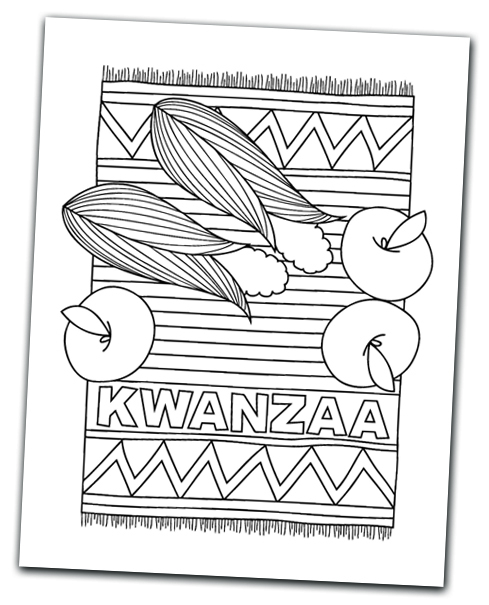 Kwanzaa is an African-American holiday about the festival of the first harvest of the crops. It begins on December 26, and lasts for seven days. The name Kwanzaa, sometimes spelled Kwanza, comes from a phrase which means "first fruits" in Swahili, an East African language. Each of the seven days of the celebration is dedicated to one of seven principles. Each day one candle is lit that represents each principle. The last day of Kwanzaa focuses on honoring traditions and reaffirming self worth through gift giving. Gifts are often made rather than bought because Kwanzaa emphasizes creativity or "kuumba" - one of the seven principles. You should not make fun of their beliefs, customs, or practices. Respect the religious symbols they use to celebrate and worship. If you are invited to participate, ask politely for their suggestions about how you can do so appropriately. They may be happy to simply have you watch what they do, or they may suggest some activities you can join in on and others you should avoid. For example, if one of their religious customs is against your beliefs, such as drinking wine, you can politely decline participation, or perhaps you can drink water. Bear your testimony about the fun that can come by learning about, participating in and respecting the beliefs of others. Share the good feelings you have when members of other faiths have done the same for you and your beliefs. - Have children color each side of dice. - Cut out, glue or tape and play a few rounds. A friend sent me a link to your sight after telling her how simple I need the fhe lessons to be. I have 4 small children and my husband travels a lot. Your lessons are great and they take less than 10 min to prepare. I also like how you have a theme for the month and then do mini lessons to support the theme. We had a very successful FHE thanks to you. I love the 11th article of faith and am grateful for this lesson, thanks! I love your FHE lessons! I found another Hannukkah FHE lesson on a different site and teh explanation of the story was too long/involved for my three little ones (6,4,2). I love how you make the explanations simple yet keep the important details. This is perfect for tonight. Thanks so much!